We all know that Logitech does have some pretty decent speakers for the home, and these offer a great deal of bang for your shrinking buck. What about Sony Ericsson? They’re more well known for their line of Cybershot and Walkman range of handsets, and to see them release the MBS-900 Wireless Home Audio System is refreshing, as it shows the company is willing to step out of its comfort zone to offer something new and different to the masses. 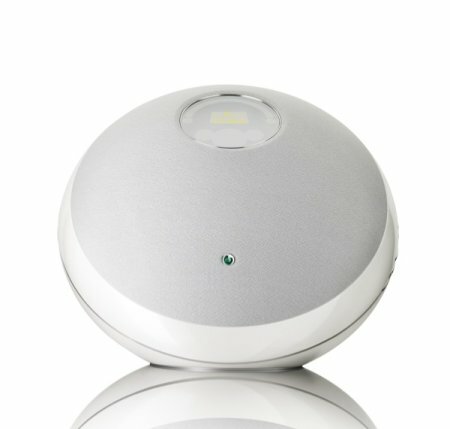 First of all, the MBS-900 speaker works wirelessly thanks to Bluetooth connectivity, and comes in a really stunning and innovative design that is sure to set tongues wagging whenever somebody steps into your home and lay their eyes on it for the first time. The high quality, dual speaker and sub-woofer system is touted to offer great audio, but seriously – it won’t replace a dedicated home theater system anytime soon, but will definitely beat your regular headphones or small time speakers into submission. Of course, the audio quality of the song also depends on what kind of encoding you use, so don’t go blaming the MBS-900 if the original file itself sounds like crap. You can adjust the music settings of the MBS-900 via your cell phone (of course Sony Ericsson will claim it is best used with their handsets, but generally, any MP3-playing, Bluetooth-enabled handset will do just fine). For those who prefer the sense of touch, there is the presence of touch controls on the speaker itself for seamless and smooth control. Whenever your phone rings when you’re streaming audio to it, the MBS-900 will cleverly shut itself up so that you can carry on speaking in peace. Once you’ve run out of MP3s to listen to, there is always the built-in FM radio for you to tune in to the latest antics of your local DJs. There is no word on how much the MBS-900 will cost, but it will hit the markets in Q1 next year.